How do I get the Monster Summer Fun Journal? Here's a fun activity for kids to do this summer! What is the Osmo Monster game? Osmo Monster is a magical creative experience. You can help Mo, your furry orange friend, create his world in this interactive storybook. Draw a magic wand for Mo, and he'll use it to bring all your other creations into his world! Since the computer vision and detection systems for Monster are optimized for use with the custom designed, high quality Creative Board and dry erase or liquid chalk markers, we highly recommend purchasing the Creative Set to accompany the Monster game. Note that the Creative Set will also enhance the player's experience with Newton and Masterpiece. The Creative Set is available for sale on our site playosmo.com and on amazon.com. Where is Osmo Monster? It's not in the box! For the best possible play experience, we recommend playing with the Osmo Creative Set. What ages is Osmo Monster designed for? Mo is looking for kids aged 4-11 years old to play with in Osmo Monster. What is the educational value of Osmo Monster? Monster teaches drawing skills and builds creative confidence. Monster brings your drawings to life! Each item you draw for Mo (our monster) is magically pulled into his world. Together create animated activities to share with family and friends. Monster is designed for kids aged 4-9. Do you have instructions for Osmo Monster? Did you know that there is an in-app manual to help you get acquainted with Monster? It can be accessed via the Settings menu, under Manual. This guide introduces all the game play and game mechanics. I see shadows next to my drawings in Osmo Monster; what can I do? You may see shadows next to the drawings in Monster if your room is poorly lit. The best way to get rid of the shadows is to add additional room lighting. If this doesn't help, it is possible that there is another issue. Please write us at support@playosmo.com with pictures of your setup and the captured drawings with shadows so we can provide further help. Do I need the Creative Set to use Osmo Monster? 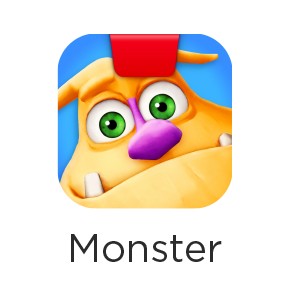 Monster, like all of our apps, is available to download from the App store free of charge. And like most of our other apps, it requires game play pieces to ensure a great game experience. With the release of Monster, we've introduced a custom designed and engineered board with a very high quality surface that will not stain. Note too that the Creative Board fits neatly against the Osmo stand, ensuring that there's limited movement and that the hardware stays aligned during play. How is Osmo Monster different from Osmo Masterpiece? In Osmo Monster, your child's drawings become part of magical animated stories with the help of Mo, a furry orange friend. Each item drawn for Mo is magically imported into his world. And every animated story can be saved to replay for family and friends. The Osmo Masterpiece is a free-form tool that helps you create your own art. What languages does Mo the Monster speak? Mo the Monster speaks in English and Spanish! And it doesn't use Siri for pronunciation at this time. Regardless the default language of the iPad, players will have the ability to select either English or Spanish by clicking the gear in the upper left hand corner of the iPad. Both the language of Mo's voice, as well as the language in the speech bubble can be selected from these two languages. For all other languages, the "Asks" themselves (the words in the top right corner that Mo asks you to draw) are localized into your iPad's default language. When does the gallery become available in Osmo Monster? The gallery becomes available after you complete at least one magic show. How do I delete images in Osmo Monster? In Monster, if you keep going, every play-through will be different. You can redesign any room with the Paint Roller icon if you want, but if you really want to clear images, the easiest way is to delete the app and reinstall, this will wipe all saved images. Alternatively, you can go to your player profile in myOsmo, and reset your progress there. To do that, go to https://my.playosmo.com/, click on your name in the top right corner and select "Profiles" from the dropdown menu. Then select the player profile that you want to reset progress on. If you have many players (such as in a school setting), we know this is not the most ideal situation, and we're working on adding in a manual reset that should come in a future version. What output is created after playing with Osmo Monster? After playing with Monster, your magic show (and other future activities) are saved in a great shareable video that is fun to show the whole family! If you've played Masterpiece, it is similar to that time lapse video. How many potential variations are there for Osmo Monster? There are over 60 different individual creation activities, each magic show is made of 7, and so there are over a million possible magic show variations. That is, if you only ever want to do each of these creations once. We've found that most kids find some that they want to do over and over and over again. We also plan to release two more entire activities beyond the magic show (as free updates, no new hardware required). Can Osmo Monster be played with the sound off? Technically yes, but we really don't recommend playing without sound. Mo has lots to say to his dear Osmonauts and wants to be heard! If you're in a public place, you can play with headphones on. Why can't I hear Mo the Osmo Monster when he's speaking? Check that your sound switch is not on vibrate mode (the switch next to the volume controls) and the volume is turned up. Still having issues? Try closing the app and restarting it. Osmo Monster is picking up things I didn't draw. What's going on? Please ensure you are using an Osmo Creative Board and that it is clear of residue, otherwise Monster might think the residue is part of the drawing. Ensure things besides the drawing (like hands) are outside of vision. You should also make sure the board has been wiped clean between each drawing. When do the new free activities come out for Osmo Monster? We are always updating all of our games, so please stay tuned via social media and be sure you're on our email list! It's also good practice to keep all your Osmo apps updated, so that you always have access to the newest content. We don't want to give anything away yet, but let's just say they will make for a great story! What do I do if Osmo Monster crashes? Any time an app crashes, it's good practice to close other open apps (double tap home button and swipe the windows up to close them). Also please try reinstalling the Monster app and restarting the iPad. If it doesn't help, please write us at support@playosmo.com with your iPad model number. You can find the model number printed on the back of your iPad.